Blackmagic Forum • View topic - Radeon VII benchmarks? 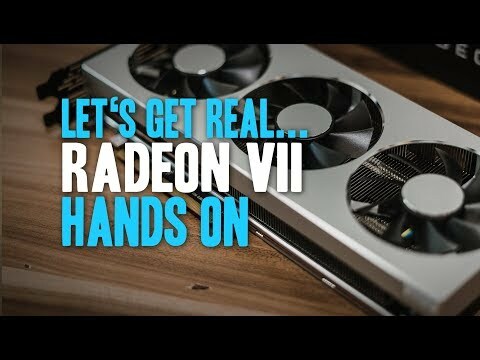 In their travels, has anybody come across any performance benchmarks for the Radeon VII in Davinci 15 yet? Considering that Resolve was one of the applications specifically listed as enjoying performance gains when the card was announced I sort of expected to at least see something by now. I know there are a kajillion sites that have benchmarked it in game after game, mostly with a decided result of "meh...", but I for one would at least like to see some transcode or NR testing. The (windows) drivers are kind of crap at the moment, that might be the reason serious reviewers hold it of at the moment. It should be very fast with effects and NR because of the memory bandwidth and the low memory latencies. Wendell at level1techs is working on a review at the moment (don't know if he will also do some Resolve). I switched from a 1080ti to a Vega 56 in my Hackintosh because of driver issues and performance in Resolve was surprisingly close. So yeah, not sure the Windows gaming results necessarily apply, especially on Mac. Test Mule was a 2010 Mac Pro 12-Core 3.33GHz Xeon X5680, 96GB of 1333MHz DDR3 memory, running Windows 7 Ultimate 64bit. Here are my Radeon VII standard candle results. Seems to be on par with a 2080Ti. Clifton Archuleta wrote: Here are my Radeon VII standard candle results. Seems to be on par with a 2080Ti. Do you have any experience working with H264 or H265 10 bit long gop footage from the GH5 or X-T3? Apologies if the benchmark project you referred is something I should know everything about by now - I guess it's the same as the one with a cup being put on the table,, right? It originally was run as HD and at 24 fps; may I know what modifications exactly has been done to it in order to get frame rates like you do; has the clip been somehow modified or just the playback speed of the project itself increased? I'd appreciate it if you posted the drp here for reference (if the clip is still the same, then without the media, of course). TIA! deezid wrote: Do you have any experience working with H264 or H265 10 bit long gop footage from the GH5 or X-T3? I've worked with XAVC but don't have a GH5 so I can't comment there. I just bought the Radeon VII a few weeks ago so I haven't extensively used the card to run up against any limitations yet. Regarding the framerate, you need to change the fps of your project to a high number like 200. If you're using a Blackmagic card for monitoring, you might need to bypass it for this test since it will most likely try to cap your framerate to the max refresh of the monitor. Thanks - so you didn't change anything about the clip itself? No fps change, just that of the TL? Piotr Wozniacki wrote: Thanks - so you didn't change anything about the clip itself? No fps change, just that of the TL? Correct. No need to touch the clip, just change the framerate in the playback settings. Hmm. I bypassed my Decklink, but it seems my UI monitor caps the fps to 60 - nothing more than that possible; what am I missing? PS. Also, the max fps for playback seems to be 120 in Project Properties; how did you set 200 fps? I just entered 200 and it accepted. Not sure why your system is capping if you bypass the Decklink. Don't know what to tell you, must be something unique to your setup. I'd delete the project and import it again, then set the framerate before doing anything else. OK, it works and my Titan Xp numbers beat yours, haha (of course, I have 2 of them). Just in case people missed it.